A cry of pain from a child playing with a pet is a sound most parents dread. Dealing with hurt children and scared pets is not a nice situation to be in, but if handled in a calm manner you can minimise the effects greatly on both your kids and your pets. While the first instinct of a protective parent may be to yell at or chastise the pet that’s caused harm to your child, try and refrain. 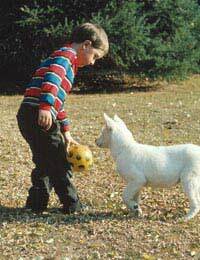 Most often, kids who get hurt by pets have inadvertently caused the attack by either not reading the signals their pet was trying to send them, overstepping a boundary they didn’t know existed with their animal or petting and playing in a way that accidentally hurt their pet. Punishing a pet for reacting in self defense to a painful or scary situation is not only unfair to the animal; it often causes negative feelings in your pet’s mind towards your child. Instead, listen sympathetically to what happened, then sometime after the hurt has been dealt with, have your child tell you the story again and try to determine then what factors triggered your pet’s attack. Animals have a variety of bacteria in their saliva and under their nails that can cause illness in humans so make sure that any scratches or bites get thoroughly cleaned out. Many wounds can be treated at home but some definitely need immediate attention by a medical professional. Any wound that won’t stop bleeding after 10 minutes needs medical attention. If your child is bitten by a strange dog or cat or your pet isn’t up to date on their shots, you may want to consider taking your child to the doctor as well. Wounds from small animals like hamsters and gerbils are considered very low risk for infections, while wounds from reptiles and birds are far more likely to transmit illnesses like Salmonella and are considered more serious. Dog bites and scratches are less likely to get infected than cat wounds since the sharper claws and teeth of cats cause more tissue damage than dogs, penetrating deeper into the flesh. Wash wound 2-3 times a day with antibacterial soap, then apply antibacterial ointment. Put clean bandages on every day. Allow the scar to thoroughly heal, a process that usually takes about 2-3 weeks. Then apply a thick moisturising cream (preferably one with Vitamin E) to the scar and massage for 10 minutes every day until all the pink fades to pale white. This generally takes at least a week or two, depending on your child’s healing ability. If you follow this practice it will greatly reduce pink, redness and buildup of scar tissue. Make sure that you also protect the healing area from the sun as this will increase scar darkening as well. Use sunscreen of at least SPF 15 on the area once the wound is healed and try to cover with a long sleeved shirt or band of cloth. Being hurt by a pet or strange animal can strike a serious blow to a child’s confidence and be detrimental to the kid/pet relationship, it’s natural for children to be hesitant towards animals for a time after being hurt by one. But for the sake of your child’s development, these fears need to be addressed and overcome. Talk about what happened before the pet lashed out and show your child what could have been done to prevent it or what their pet was trying to tell them. Helping children read and understand animal body language goes a long way towards preventing pets from lashing out. Explain that animals often bite or scratch when they feel scared, cornered or frustrated and that it isn’t a personal attack but rather an instinctive reaction. Let scared kids control the environment they see their pet in can also help to alleviate fears. A simple action like holding children while around their pets may give them a feeling of security. Keep interactions short and positive, if your child is feeling too scared to continue the session, don’t push it. It’s best to try again on another day when confidence levels are higher. And remember, children pick up on the fears of their parents so you need to reassure yourself and dispel any personal concerns about a pet hurting your child before working with them on confronting their own fears.